This recipe, golden cream dory nuggets can be a good appetizer or viand specially in occasions like this coming holidays. Cream dory fillet or pangasius fillet is easy to find in supermarket fish section or in the frozen fish products sections. But it’s up to you to choose the kind of fish if cream dory is not available. You can also use fresh whole fish and fillet it yourself and labahita or tilapia can be a good substitute. 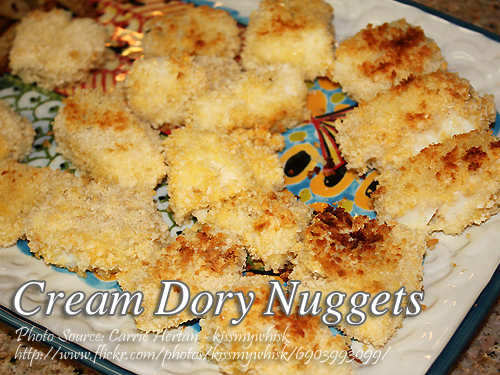 To cook Golden Cream Dory Nuggets: Steam fillet until cooked. Let it cool then flake the fillet. Combine onion, sweet potato, black pepper and salt until all the ingredients are thoroughly mixed. Form two teaspoons of mixture into a ball and shape into nuggets. Do the same thing to the rest of the mixture. Roll in flour each nuggets and dip in beaten egg then roll in bread crumbs. Deep fry until golden brown and serve hot with sweet and sour sauce or chili sauce or tartar sauce. To see the rest of the recipe with the exact measurement of ingredients, continue reading. Steam fillet until cooked. Let it cool then flake the fillet. Combine onion, sweet potato, black pepper and salt until all the ingredients are thoroughly mixed. Form two teaspoons of mixture into a ball and shape into nuggets. Do the same thing to the rest of the mixture. Roll in flour each nuggets and dip in beaten egg then roll in bread crumbs. Deep fry until golden brown and serve hot with sweet and sour sauce or chili sauce or tartar sauce.